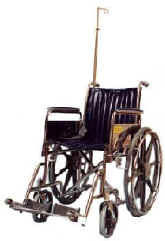 This wheelchair is designed to accommodate almost any size patient, (18" wide seat). The cushioned front and rear wheels makes handling an easy task. The wheels lock easily for storage. Fold-Up Foot Pedals with Leg Strap. So many features for such a low price! 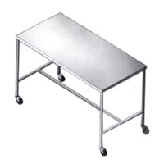 Stable 5-spoke wide base with smooth-rolling casters exceed tilt test requirements, an aluminum adjustable (to 83" high) pole and quad-pigtail top. Storage drawer and guard rail on three sides, shelf on bottom, 2" Non-Magnetic Swivel Casters. It is recommended at least one extinguisher to be placed in the magnet room and the control room. In addition, we strongly advise that all fire extinguishers in the general area of the MRI be replaced with non-magnetic extinguishers to reduce or eliminate the possibility of a magnetic cylinder being brought into MRI. These non-magnetic MRI stools are equipped with anti skid top surface and rubber tipped legs for patient stability. Stools assist operator to reach up and over to properly position the patient. These stools are available with or without a rail. Stool has fully upholstered foam seat. Screw-type adjustable seat. Rubber foot tips. Available with or without backrest. Height from 22" to 30".